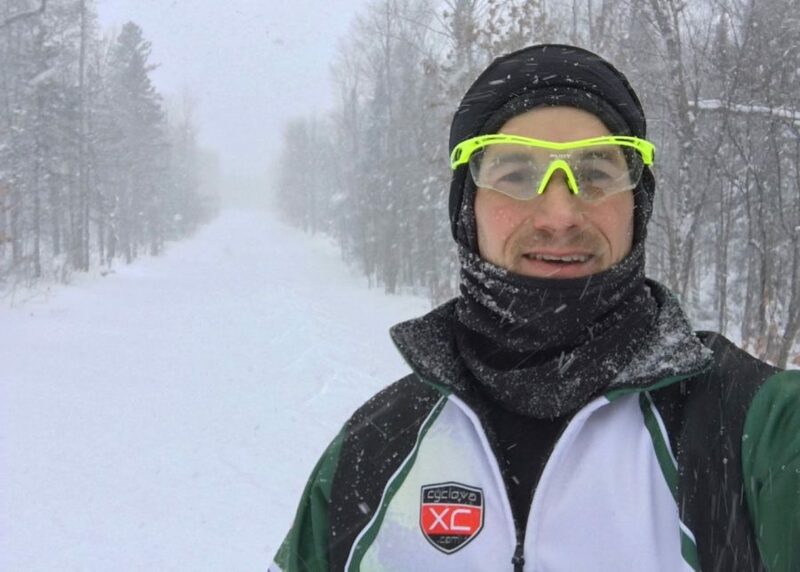 Michigan Tech has an extensive system of Cross Country Trails that have been expanded a great deal since I graduated from Michigan Tech in 2001. Although I mountain biked the Tech singletrack quite a bit during my college years, I had only skied on the Tech Trails once or maybe twice with some loaner classic skis. I actually don’t remember it much, but do remember getting some loaner skis a couple times back then. Since then, I have passed through the singletrack a couple times these last few years on my mountain bike. This would be my first time back to the Tech Trails on skis in 16 or 17 years and pretty much like my first time in all relativity. 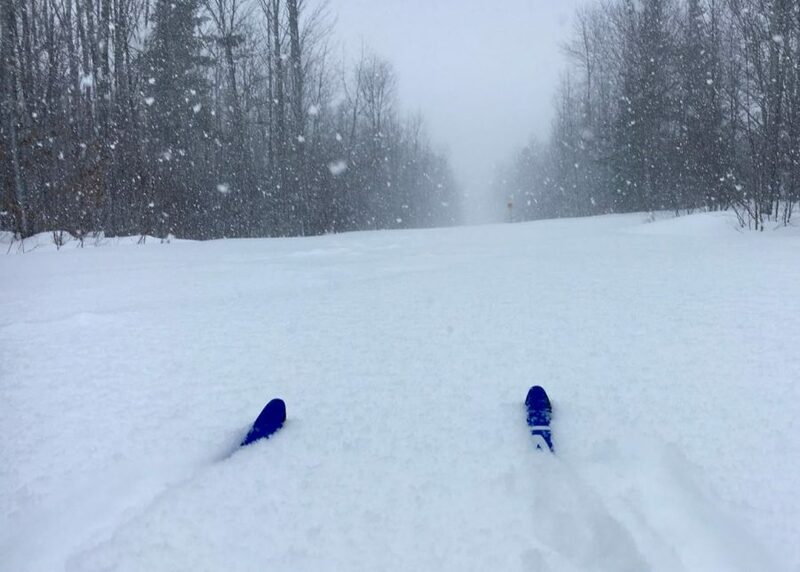 I put in a little over 12 miles between 2 days of skiing the Michigan Tech Trails, while never quite timing the groomer right amid the lake effect snow that was coming down throughout my visit to the Keweenaw. As I mentioned in the opening paragraph, I never quite timed the groomer well and today was probably the worst. The lake effect was coming down when I arrived and the powder was already building up on the trail, but I was determined to do some skiing anyways. I decided to start light with the flatter, beginner trails off to the west of the trailhead. The trails are all very wide and great for somebody trying to get the hang of things. The snow was tacky and making me work for it, but that’s fairly irrelevant with my knowledge of the snow, wax varieties and plain waxing capabilities for that matter. At anyrate, I was able to get a few moments of good form and my skis did seem to glide ok and I really enjoyed it. I had rewaxed my skis after my visit to the Swedetown Trails a couple days prior. There were basically 3 loops that went out and back to the main trailhead line. The 2 bottom loops on the west side have some nice long and gradual downhills headed back to the east. These were helpful in letting a newbie like me work myself into a nice form without much resistance and still move along with some decent glide. If the powder wasn’t stacking up so deep, I think I would have been in pretty good shape in the flats. I made it back out to the main trail head area after skiing all of the beginner trails to the west and decided I would go ahead and drop down into the valley to the east. I had biked through here a couple times the past few years and many times while I was attending Tech over 15 years ago. I knew that I would have a heck of a climb back out for my skiing abilities, but I didn’t really care and decided to go for it. The powder was stacking up deep now and my entire ski would disapear at times. About halfway down into the valley, there is a little loop off to the south that I decided to check out. It was mostly flat, but like most of the Tech Trails, scenic and peaceful. There is so much land out there and miles of groomed trails. It really is quite amazing and impressive. It has been completely transformed since I attended Michigan Tech. After coming out of that loop, it was only a short distance down the main trail again and I would have the opportunity to start making my way back up to the trail head area, but I couldn’t help myself… I pointed my skis downhill and decided to head to the bottom where I would find a tight hairpin turn that would send me back uphill. By the time I duck walked all the way back out of the valley, I was pretty exhausted and my thighs were burning. I did try to get an uphill glide going on occasion, but there were some steep grades with a lot of powder stacking up. When I got out of the valley, I took the shortest way back to the trail head and called it a day. I still hadn’t timed the groomer perfect, but I was definitely much closer to the grooming time than the previous day. I headed down the same main trail that took me to the bottom of the valley the previous day, but exited left about halfway down where I jumped on the black diamond trail that would connect me to the lower trail section. There is no access from the bottom of that hairpin I mentioned above on day 1. Missing that left would have sent me down to the bottom of the valley to the hairpin with a climb out, only to come back to this trail intersection to the left. The black diamond connector trail was fun with plenty of downhill glide and not a lot of straight sections, if my memory is correct. There were a few short steep uphills as well. Once to the bottom of the black diamond trail, you hit an intermediate trail called the down under loop that completes the connection to the official lower trail system. It might event be considered part of the lower trails as well. At anyrate, the hills become a little less steep and the skiing is slightly more relaxed, but not without hard work. I believe I skied all of the beginner and intermediate ski specific trails in the lower loop. When I was attending Tech, I don’t believe any of these ski trails existed in the lower section. I do remember riding a singletrack loop down to this area, but I don’t remember any ski trails being down there. As you can also see from the elevation profile, there is not a lot of flat skiing. You are either headed up or down most of the time. It really was a lot of fun. There are a few downhills that are really steep and of course you have to make your way back up at some point also. At the very bottom, I came across a big sledding hill where there were 2o to 30 people enjoying some good sledding. This was near the bottom of the trail system and not that far from the lower trailhead, I believe. I eventually had to make my way back up to the main trail head of the upper trails, which meant some more time climbing the hills of some black diamond trails. I was spent by this time and did a little less gliding on the uphills and a little bit more duck waddling. I’m sure there is an offical ski term for it, but that’s what it felt like. I remember coming to one downhill that was pretty awesome and built up some good speed. 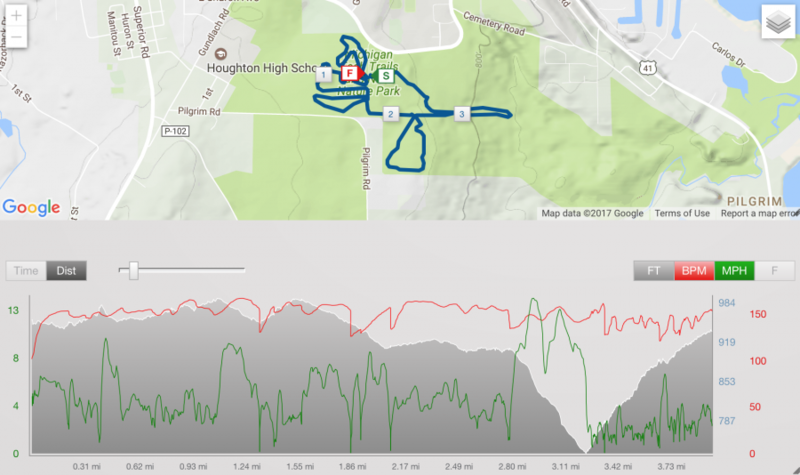 This actually happend more than a few times with speeds around 20 mph, according to my Garmin. I just remember this specific one on my way back to the upper trail head, that was particularly steep. Anyways, I eventually made my way back to the main trail head of the Michigan Tech Trails where I decided that I wasn’t really ready to hang it up for the day. 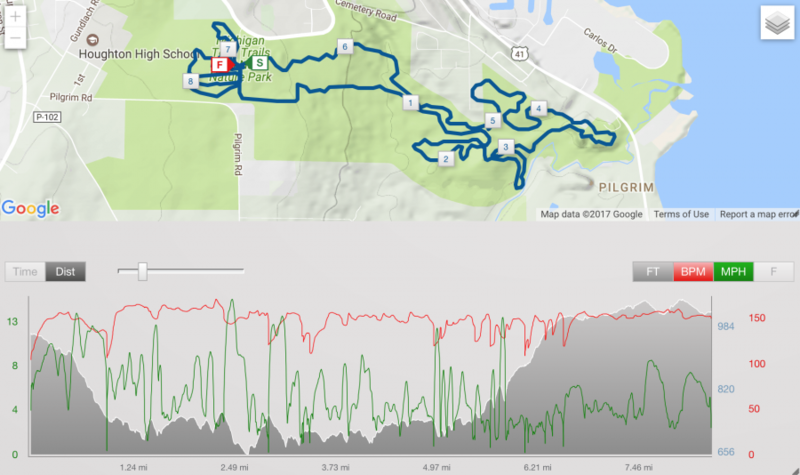 I was spent, but thought it might do me some good to hit the beginner loops near the main trail head and try to workout my form again on some flat land after doing all that climbing back up to the main trail head. I was tired, but made a full lap around the 3 beginner loops and then officially called it a day. The bottom line, is that the Michigan Tech Ski Trails are phenominal. I don’t have a lot to compare to, but I have been on a handful of trail systems between trying out classic skis a few years ago and getting out once last January. 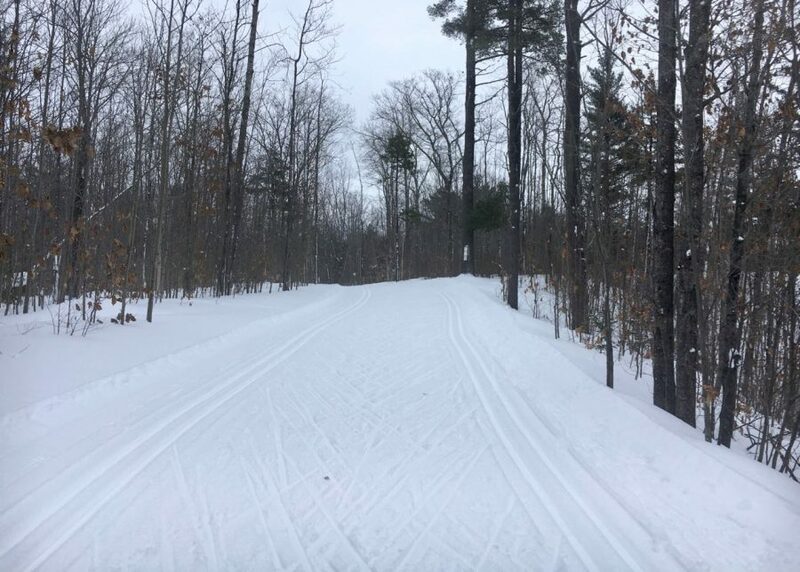 I would tell you that if you are into cross country skiing, then you should consider Houghton, Michigan as a destination ski place and spend some time on the Michigan Tech Trails. You won’t get bored and if for some strange reason you do… There are multiple other really great cross country ski trail systems in the area. Check the links at the bottom of the report for the Keweenaw Trails. There is a chance that I will have the opportunity to get back on the Michigan Tech Ski Trails again later this winter. If I do, then maybe look out for another report or maybe I’ll even append this one and add to it. I also spent at day at the Swedetown Ski Trails in Calumet, but I’ll write that one up separately if I get some time.